In August 2011, the NGO Wildlife Alliance announced a single Giant Ibis Thaumatibis gigantea had been captured on a camera-trap photography taken in the Southern Cardamom forest. 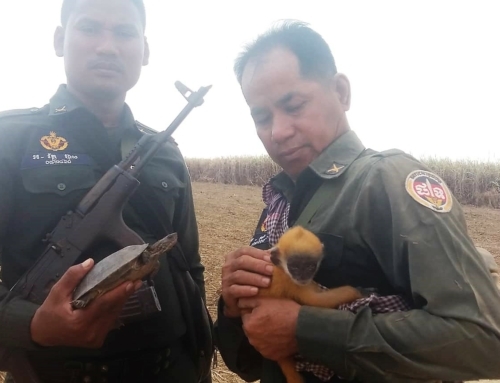 This news came as a total surprise, as the Critically Endangered species and national iconic bird of Cambodia was considered long extinct in the southern part of the country. 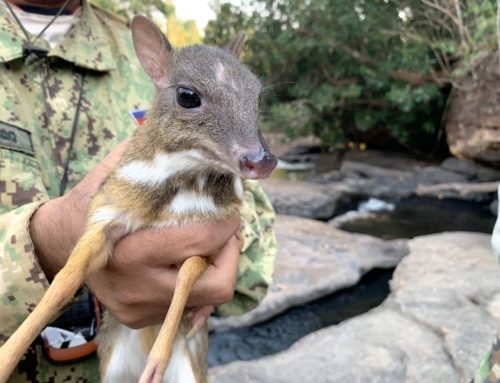 None of the numerous surveys conducted during the first decade of the 21th century in the Cardamom Mountains region had found the species and suitable habitat was considered too fragmented or degraded to sustain any surviving population. The vast dry deciduous forest of northern and eastern Cambodia was known to support virtually all the remaining population, estimated at 300 mature birds estimated by Birdlife International (2018). The press communiqué further declares that “next steps are to engage in more research to determine the size of the population and whether this Giant Ibis indicates the presence of a breeding population which would bring new hope to this struggling population.” (Wildlife Alliance 2011). 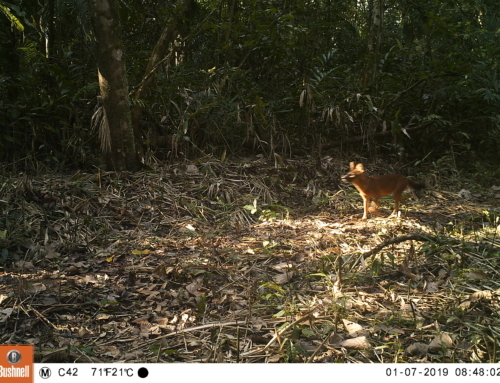 The fact that the species is strictly resident and territorial as well as the time of the camera trap photo (during the species’ breeding season) were two elements speaking for the actual presence of a small population rather than a lone vagrant individual or survivor. 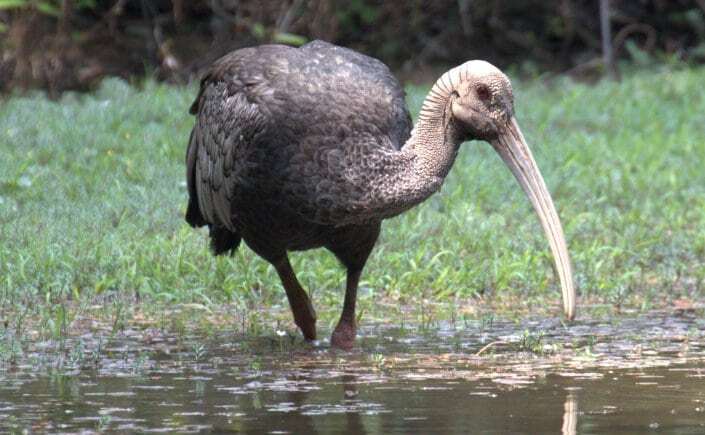 However, no further dedicated work was done to investigate this incredible discovery, until the present survey conducted in January 2018, more than six years after the bird was photographed and exactly a hundred years after the historical record of a Giant Ibis in Koh Kong province (Williamson 1921). Wildlife Alliance organised the logistical arrangements and assigned two rangers from the Sre Ambel station to accompany the surveyor. A GPS and 1:50.000 topo-sheets of the target area were provided. The survey took place from 28 to 31 January 2018. The team consisted of Phirun (MoE ranger), Chamroeun (military ranger) and Frederic Goes (ornithologist). Typically, one of the rangers would accompany the surveyor while the other remained at the camp as guard and cook. discussion and informal interviews of local villagers, using Robson’s field guide (2008), showing plates featuring Giant Ibis and four other key and distinctive species likely to occur (Green Peafowl, White-winged Duck, Black-necked Stork and Sarus Crane) initially without pointing to or naming those species. 9:30am: arrival at Sre Ambel ranger station; preparation and travel to Kamlot village by motorbike (11:00am to 4:00pm); camp installation at the village pagoda; foot survey around the village until dusk. 5:30-11:00am: motorbike and on foot to Giant Ibis camera trap location (UTM 11.439103.697), first driving track heading southwest of village, then returning along main track towards Sre Ambel, and heading off on foot along disused oxcart tracks; site found, but habitat unsuitable for Giant Ibis in the dry season (no seasonal pool). 3:30-4:30pm: following information collected from an elderly villager, heading by motorbike on track towards the river east of the village, to cross ford and reach Tropeang Lopieng (UTM 11.447-103.737); several tracks leading to the riverbank were found but the crossing and opposite bank trail remain elusive, despite explanations provided by a woman met on the way. 4:30-5:30pm: on motorbike towards the east of Kamlot: encounter and interview of several group of villagers and finally turning back to paddies south of the village where a villager says the Ibis come to feed daily! 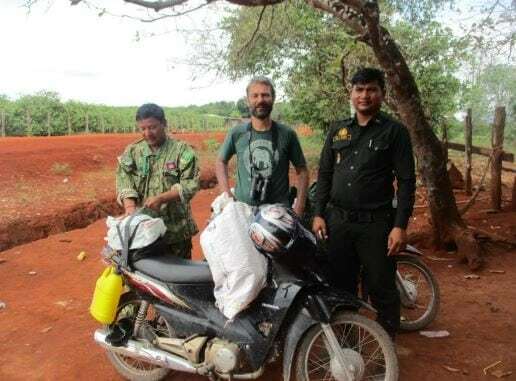 3:00-5:00pm: on motorbike for 10km+ on main track heading northeast of Kamlot, to Chaeng Saèk and Chay Reap villages, through good dry forest with patches of semievergreen forests. During 16:00-17:00, the ranger who stayed at the village went to check Boeng Veal Srae. 5:30-10:00am: revisit Tropeang Lopieng (surveyor alone) at dawn, silent posting/hide, and then travel back to Sre Ambel; arrival at Wildlife Alliance station around 2:00pm. The survey team encountered several constraints, which all affected the survey effectiveness to some degree. 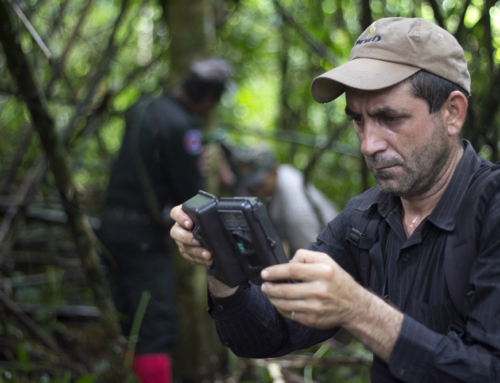 Technical issues prevented to have sound recordings and the equipment enabling to play the calls of Giant Ibis in the field, despite last minute efforts to use the rangers’ smart phones for this purpose. This would have been a very useful tool to further assess villagers’ knowledge of the species as well as to quickly ascertain species presence/absence through playback of calls at adequate time of the day. Rains exceptionally continuing late into the dry season, with daily downpours in the region, resulted in wet-season road conditions, i.e. longer and perilous travel to the target site. Swollen rivers made a main ford almost impassable and nearly led to survey abandonment. 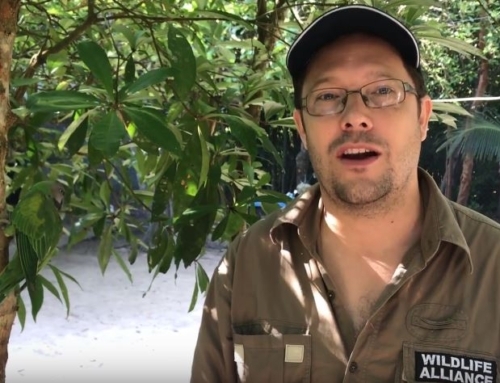 This factor also lowered odds to find the Giant Ibis, as wet soil conditions makes the species less likely to feed in permanent (dry season) pools. Fortunately, only one light rain occurred during the survey, providing progressively more favourable survey conditions. Last but not least, the defiant attitude of villagers towards Wildlife Alliance staff was an unexpected and personally unexperienced constraint. 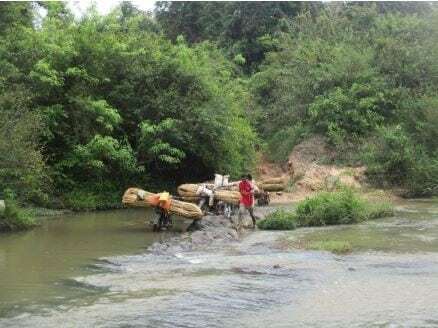 On the suggestion of leaving our motorbike at the ford to continue on foot, the rangers simply answered: “protitchoun so-op Wild Aid”, which gave a rather frightening idea of the unfriendly relationship between the local communities and our team. In Kamlot, obtaining key information and finding a villager to guide us through some foot trails across the river took a full day, which was practically lost for the proper field survey. The local guide that we finally found did not want in any way to be seen with us in the village. The survey confirmed the continued presence of a small and self-sustaining population of Giant Ibis in the vicinity of Kamlot village. 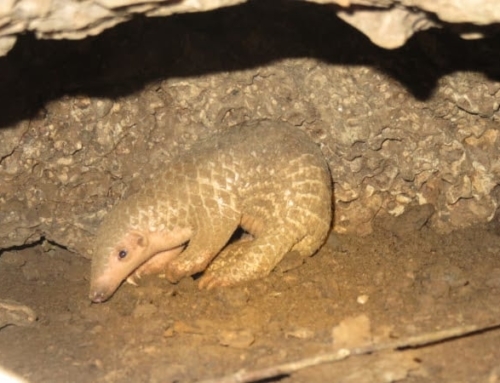 This was obtained through consistent villager’s knowledge of the species as well as by hearing its call and direct sightings on two consecutive days. On 29 January, no Giant Ibis, neither calls nor signs were detected. 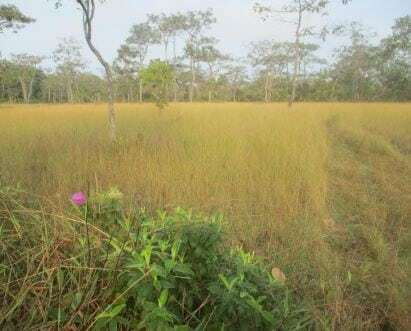 The camera-trap site (visited in the morning) was located at the edge of a patch of semi-evergreen forest with dry deciduous forest, but no permanent or seasonal pool was visible in the vicinity. The site is therefore unlikely to be used by the species at this time of the year, although one may argue that given the extended wet weather this year, the environmental conditions might be quite similar to those in August, when the photograph was taken. Nevertheless, nearly all persons met and questioned later in the day along tracks around the village recognized Giant Ibis on the field guide’s plate and named it “Ko-lôk”, with reference to its call. tree hole some 15 years ago. Mr May Miék (62) also declares seeing Giant Ibis in pairs at the same place. 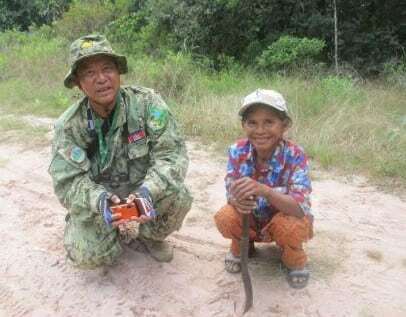 Mr Kan Chan (38), an orphan from Kamlot’s Phum Thmey village, met in the late afternoon, was quite talkative and assertive about Giant Ibis visiting Boeng Veal Srae every day. He sees up to six birds there, sometimes together with (Lesser) Adjutants and rarely Black-necked Stork. He detailed that the birds were calling at 4:00am, then come to feed at 7:00am until noon, and return again around 4:00 until 5:00pm. He then brought us to the site, a flooded area in the middle of ricefields just south of the village and with a few thatched huts in the vicinity. No large waterbirds were present. He agreed to guide us the next morning across the river to Tropeang Lopieng. On 30 January, at 5:45am, distant Giant Ibis calls were heard at Boeng Veal Sraé, but only once, probably involving two birds, coming from the southeast of the ricefields. Stayed posted there until 7:30 am, very misty, no large waterbirds came to feed. Then on motorbike to the riverbank with Chan and Chamroeun, crossed ford and followed trail through semi-evergreen forest for about 30 minutes before reaching a large permanent wetland called Tropeang Lopieng. Careful approach, no large waterbirds flushed or seen, then walked along the edge southwards, and one Giant Ibis took off from the very corner; then perched, uttering raucous protest calls for a while, before taking off further into the forest. Edge of wetlands were investigated for footprints and probe signs. No large waterbirds seen at nearby Tropeang Srae Mean Cham. In Kamlot’s Phum Tchas village, Mr Tchey, the motorbike mechanics declared that he often hears several pairs of Giant Ibis, totalling up to 10 birds! He also operates the boat travelling down to Sre Ambel during the wet season, and he has seen a pair of White-winged Ducks in a river pool called Anlong Youn, near Peam Treng village, about 5km downstream from the road ford. Green Peafowl is common along the river, he added. During the afternoon, no sign of key species or sizeable pool during exploratory travel northeast of Kamlot village. However, one villager reported the presence of Giant Ibis, Sarus Crane (rare) and Green peafowl (seen) in the area. 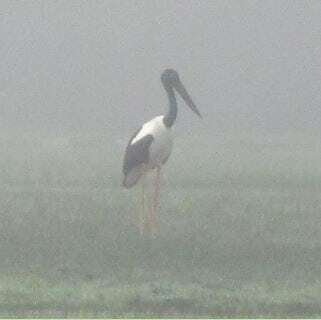 At Boeng Veal Srae during 4:00-5:00pm, Phirun saw only Woolly-necked Storks. On 31 January, arrival at dawn at Tropeang Lopieng, where two Woolly-necked Storks and a single Black-necked Stork were already feeding; at 7:00am, two Giant Ibis landed on the far shore and slowly moved towards the south; a couple of times, a third bird was heard calling distantly, without triggering response from the two feeding birds; the pond was enveloped in thick fog until after 8:30am, when the Ibis had reached the southern corner of the lake. The survey recorded 110 bird species, which are listed in the Appendix. Below are summary accounts of for key species of birds or mammals recorded or reliably reported during the survey. Green Peafowl Pavo muticus (Globally Threatened – Endangered): territorial call of males was heard twice, along the Stung Kompong Saom. Probably distributed fairly regularly along the river, upstream of the main track ford. White-winged Duck Cairina scutulata (Globally Threatened – Endangered): not recorded, but one informant confidently reported seeing a pair at Tropeang Lepieng, as well as a nest 15 years ago at an unnamed site. The species is definitely very rare in the area, but deserves further work as any small population is of conservation significance. Black-necked Stork Ephippiorhynchus asiaticus (Globally Near-Threatened): one female feeding at Tropeang Lopieng on 31 January. 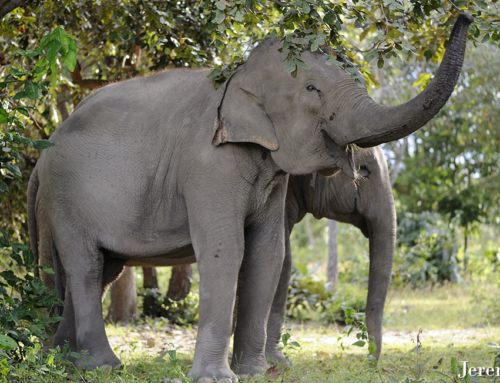 The species is very rare in Cambodia, its presence adding to the conservation value of the site. Lesser Adjutant Leptoptilus javanicus (Globally Threatened – Vulnerable): one flushed from a small water hole in the dry deciduous forest, on early morning of 29 January, south of Kamlot village. Surprisingly, this was the only observation. Sarus Crane Grus antigone (Globally Threatened – Vulnerable): not recorded, but species recognized and mentioned as present by a few people; the species is probably only visiting the area in very small number, and possibly only during the breeding season. Giant Ibis Thaumatibis gigantea (Globally Threatened – Critical): on 30 January, distant call heard before dawn, from Boeng Veal Srae; later same morning, one bird flushed from the southeast corner of Tropeang Lopieng; on 31 January, two birds landing to feed at the same site around 7:00am and observed until 8:30am; a third bird distantly calling. From these sightings plus the familiarity of most interviewed villagers with the species, the area definitely supports a population of 10 birds or more. 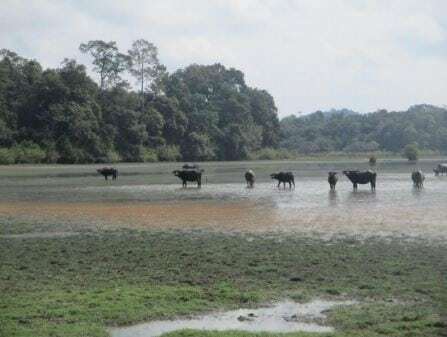 Further work should be conducted later in the dry season when birds will concentrate to remaining wetlands (Tropeang Lopieng becoming perhaps the main if not the only feeding site), as well as during the breeding season to locate nesting sites. Indochinese Silvered Langur Trachypithecus germaini (Globally Threatened – Endangered): parents with one young seen in semi-evergreen forest near the Kompong Saom riverbank, along the trail leading to Tropeang Lopieng, on 31 January. It is remarkable that, despite fairly serious constraints, the survey positively confirmed the presence of Giant Ibis and obtained sightings on consecutive days. This and the widespread knowledge of the species amongst the local communities clearly indicate the area shelters a well-established and year-round population of Cambodia’s national bird. Furthermore, consistent reports of the species feeding in close vicinity of the village is atypical, as the Giant Ibis population of northern Cambodia does not usually approach closer than 3-4 km from villages (Keo 2008). Actually, the ibis species expected to feed in such ricefield pond close to a village is White-shouldered Ibis Pseudibis davisoni but interestingly, none of the villagers mentioned another black ibis or pointed to that species in the plates, suggesting that this other Critically Endangered ibis is genuinely absent. Equally remarkably, the short survey recorded three of the five focus species (Green Peafowl, Black-necked Stork and Giant Ibis). The two other focus species (White-winged Duck and Sarus Crane) were reliably reported, and are probably still present in the area although occasional and/or very rare. Masked Finfoot would require dedicate riverine surveys and interviews. notably amongst the series of lacking species are White-rumped Pygmy Falcon and the Woodpeckers (only six species recorded, against 12 expected in such habitat). Other ubiquitous dry deciduous forest dwellers such as Indian Cuckoo, Rufous-winged Buzzard, Blossom-Headed Parakeet, White browed Fantail, Velvet-fronted Nuthatch, Rufous Treepie, Burmese Shrike and Brown Prinia were not found. It appears thus that the Kamlot dry deciduous forest supports a significantly depauperate avifauna. This low diversity is reflected in the survey bird list, where nearly half of the forest species recorded are essentially found in semi-evergreen forest (cf. Appendix). It is therefore the more puzzling that this area has retained some of its most significant component in terms of conservation. 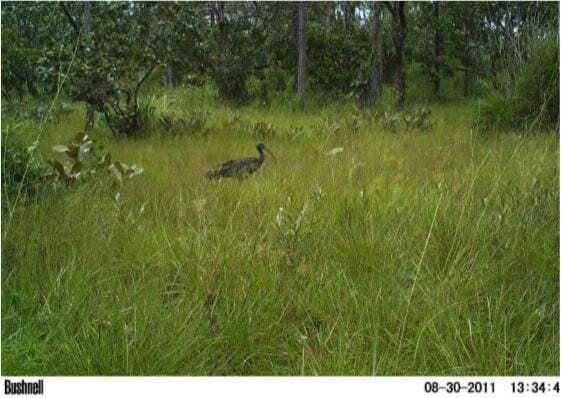 This rapid survey has documented the continued presence of a small resident population of the Critically Endangered Giant Ibis, Cambodia’s emblematic bird, along with a few other species of high international and/or national conservation significance. These remarkable findings given the constraints and very short field time, testify of the permanent presence of Giant Ibis in the area and the familiarity of the local villagers with the species. A large wetland called Tropeang Lopieng and located just 2 km east of the village pagoda, on the east riverbank of the Stung Kompong Saom, is the key feeding site for Giant Ibis and several other highly threatened species. This wetland also holds a resettled population of the Critically Endangered Siamese Crocodile Crocodylus siamensis. 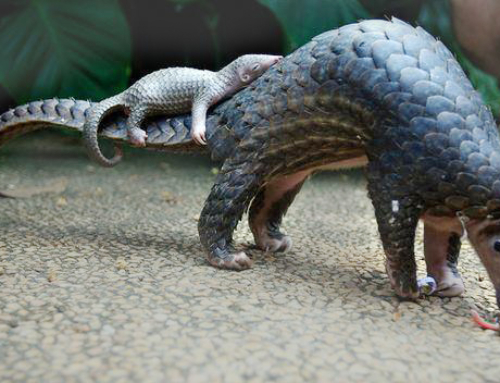 Given its highest importance for species conservation, it should be declared a wildlife refuge by commune authorities and resources should be made available to ensure its full protection from hunting, poaching and disturbance. The results of this short survey call for a number of follow-up actions in the short to mediumterm future, to further document the Giant Ibis status and ensure its conservation. To seize opportunities and consider testing a wildlife viewing circuit in the southern Cardamoms, especially if White-winged Duck and/or Masked Finfoot are later found in fairly accessible sites. BirdLife International (2018) Species factsheet: Thaumatibis gigantea. Downloaded from http://www.birdlife.org on 04/02/2018. Hance (2012) – Giant ibis discovered in new region of Cambodia. The Babbler 40: 16. Keo Omaliss (2008) Ecology and conservation of the Giant Ibis Thaumatibis gigantea in Cambodia. BirdingASIA, 9, 100–106. Robson C. (2008) – A Field Guide to the Birds of South-East Asia. New Holland, London. Wildlife Alliance (2011) – Camera Trap Photo of Giant Ibis in Southern Cardamom Mountains. Press release. Williamson W. (1921) – The Giant Ibis (Thaumatibis gigantea) in Cambodia. Journal of the Natural History Society of Siam, 4, 196.